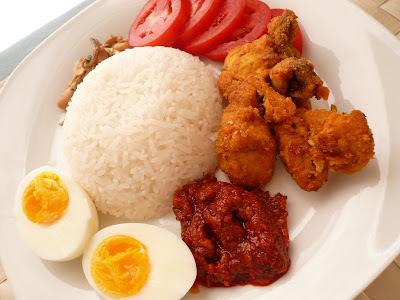 ohh i want those ayam goreng, sambal and rice, really mouthwatering! Gert,your pix really look good.My hubby puji your food and pix arrangment skill.Yum! Yum! !look like nasi lemak.now you make me wanna to cook nasi lemak!!! Wow nice plate of rice makes me *drooling* only. 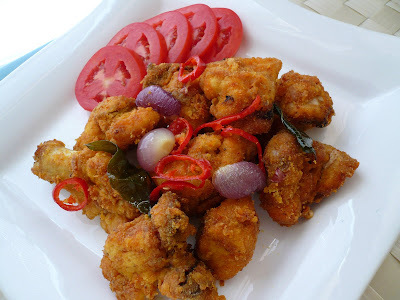 Your ayam goreng look so crispy! sedaappp with sambal. Andaliman, berapa ketul ayam you nak :) ? Lia, want to join us for lunch? Beachlover, when you cook you nasi lemak tell me ok. I join you for lunch :) Thank your hubby for me. Retno, ayam tu memang cripy because I gune rice flour. tht sounds like the ayam goreng at nasi lemak stall in bangsar. now i kno wht to do w the daun kari tht u sent me! thanks gert! My kids love fried chicken too, any style. 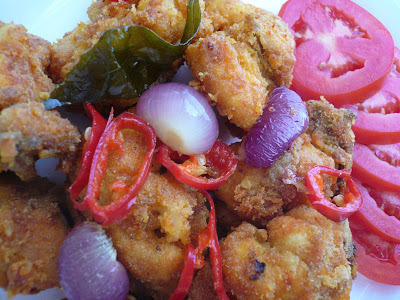 PJ, by putting the curry leaves it gave the ayam goreng a special taste.